Anyone with a plum tree growing in their yard knows that you never have just a few ripe plums. Some fruit trees ripen gently, with individual fruits ripening at their own pace. That is often not the case with plum trees. All the fruit on a plum tree tends to be ripe all at the same time and it tends to yield much more plums than any one person (or household) can use fresh all at once. Besides sharing the harvest with friends and family, the easiest way to deal with the extra fruit is to freeze ripe plums. Freezing them allows you to keep the fresh flavor of ripe summer plums so you can enjoy them later in the year. It also allows you to set aside ripe plums to cook when you have more time or the weather is cooler and you are more willing to turn on a hot oven. Note that this same method works for freezing apricots, pluots, peaches, and nectarines. Freezing plums is very simple. It makes the most sense to freeze a lot all at once since you'll be spending the time preparing the fruit for the freezer. Halve and pit however many plums you want to freeze. If you prefer to peel them, it's easier to do this before halving and pitting them. Cut the plums into wedges or whatever shape you will want for later. Slices or cubes are versatile shapes or just leave them in halves. Lay the peeled and cut plums on baking sheets in a single layer. If you have cut them in multiple shapes and plan to use the different shapes for various recipes, try to keep each shape apart from the others. Put the trays in a freezer until the plums are frozen through. This will take anywhere from several hours to overnight depending on your freezer and how thick the plum pieces are. Transfer the frozen plums to resealable plastic bags or other air-tight container(s). Label the bags and keep them frozen until you are ready to use. Use them in baked goods like a tasty plum tart or German plum dumplings. 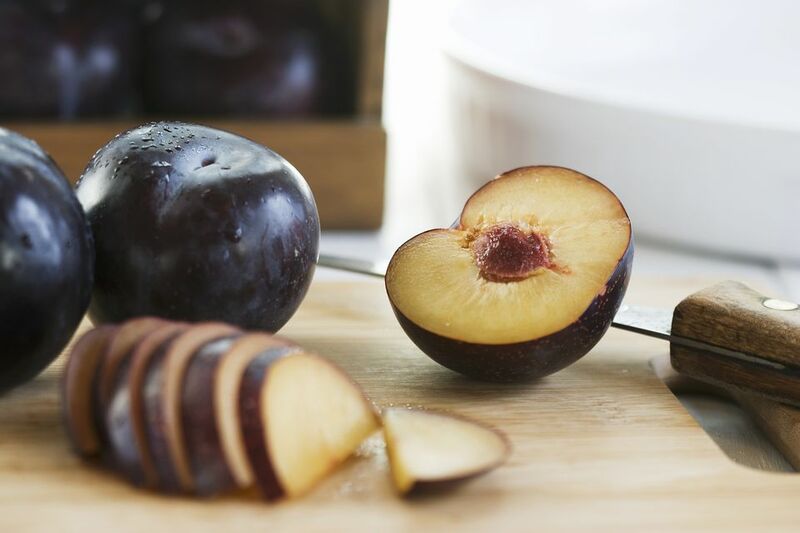 If you are using frozen plums to make jams or cook into a pie, there is no need to defrost the plums first, just start cooking with the frozen plums. Freezing plums allows you to set them aside and turn them into jam or chutney when the weather has cooled down and you have time to mind the bubbling pot. Use pieces or wedges of frozen plum as "ice cubes" in iced tea, lemonade, a cocktail, or any other drink that could use a hit of plummy sweetness. Pop wedges of frozen plums in a blender to make smoothies. How long do frozen plums last? Frozen plums will keep for about 6 months in a freezer attached to a refrigerator and up to a year in a stand-alone freezer. More time will start to degrade the quality of the plums but isn't necessarily dangerous. If you find some plums that have been in there a bit longer, turn them into jam since the texture of the fruit doesn't matter.